Okay – the subject matter is quite amusing but it was the best way to get the K-Bear to pose for a picture. Her tongue was green from the freezer pop I gave her so I said “stick out your tongue for a picture” – and it worked! I hope these tips are helpful for somebody out there. I just like to share because I thought the information was valuable when I learned it so maybe it will help someone else. And, it’s good to know that you can take really cute pictures with a simple point & shoot camera – if you know a few tricks. 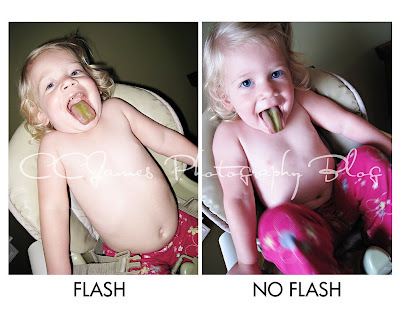 So, for this episode of “photo tips” you get to look at my daughter’s enormous green tongue. These two pictures are straight out of the camera. I took them with my Canon SD870IS (point & shoot camera). We are right next to the window and the first picture is with the flash and the second picture is without. I thought it would be cool to illustrate how different a picture can look with/without a flash. The camera is still in AUTO mode so you don’t have to be an expert or anything – just turn your flash off. Notice the one on the left is much sharper (because the flash “freezes” any motion) but it’s harsh and un-natural looking – and there is a shadow around the right side of her head. In the second picture you can see some blur around her legs (because the shutter speed is slower without the flash) but I think it’s worth it to capture a more natural color and feel for the picture. Another thing I like to recommend is GET CLOSER! Most point & shoot cameras have a very wide angled lens – which means they push your subject further away than they already are. So move in – fill the frame – and get a great picture! Lastly – don’t be afraid to tilt your camera a little to get a different angle. Play with it – your pictures will be more unique and interesting. As always, you can click on it to see it better. Enjoy the GREEN MONSTER! Lisa – Wow what a difference. I love the tips keep them comming!